This is an extremely good ride. Do yourself a favor and go on this ride as soon as it opens otherwise your looking at about an hour in line. Although i have to say that it is definitly worth the wait. The station is ok nothing really special. But its the first ride you see when u walk into the park. AMAZING and really sets the mood for the day. if your afraid of heights start off on a smaller roller coaster becuz this one has no forgivness once it starts! Excellent ride.... my favorite in the park by far! This is one of my favorite roller coasters of all time. Upon entering the parking lot, this beast stands tall, as if guarding the park. When you enter the line for Shivering Timbers, you get to look at the vista for a brief moment. The scenery may not be all that amazing, but it makes you think of how Cedar Fair has really fixed up Michigan's Adventure. The station is a very basic design and pretty cramped, but that is easily ignorable. When choosing a seat, remember that they're all good, especially the front. But if you want an intense ride, go to the back. You'll get whipped over every hill and every turn. The airtime on this ride is consistantly amazing. When you get to the top of the lift hill, it strikes you how amazing this ride is. All you can see is hill after hill ahead. For the next couple minutes, you will be floating and sinking and then floating again. 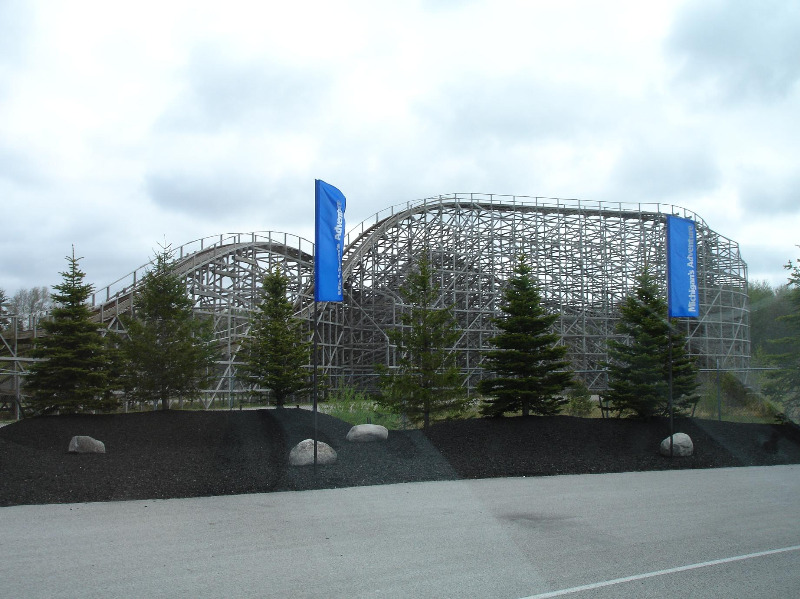 People have complained about the monotony of only airtime, but that is exactly what an out and back coaster is designed to do, and Shivering Timbers is at the pinnacle of out and back design. This purely amazing ride also has some great lateral g-force. The trick-track is a little rough but still a great little surprise every time you ride. The helix is the exact definition of what a helix should be. It's 630 degrees (1 and 3/4 full circles) of pure intensity. You should pick your seat depending on how you like your roller coasters. If you're like me and can take a hit, ride in the back for a rougher, but better ride. If you like smoother coasters, Ride in the front. No matter where you ride it, Shivering Timbers is always awesome. It never seems to let up its pace and can be counted on to consistantly provide good quality rides year after year. I have never come off this ride frowning. Shivering Timbers seems to be one of the more well-preserved CCI woodies around. Although I generally prefer a few more turns, the out-n-back lay out works pretty well in this instance. The airtime was pretty solid floater air in the front seat. There is plenty of it and it did not get monotonous. Apart from a few exceptions, airtime is the main thing I seek in a coaster. So, why does this apparently world class coaster get a mere 8? Colossos at Heide Park. As I rode Timbers, my mind kept going back to the fact that this just seems like a tamer version of the German ejector air machine. For me, ejector air always beats floater air. Also, I am not really much of a fan of the trick track element, but I am not going to hold that against Timbers. Maybe a few awesome rain rides would bump Timbers up to a 9, but I am going to keep it at 8 for now. I have been riding this roller coaster for basically as long as I can remember. The thing I love about it is its simplicity that still surprises you. It&#39.s always the ride you just keep coming back to over and over again. The several years in the past I have gone the ride operators have been young lively people that make their riders laugh before they send them off screaming. This year they weren&#39.t as pumped for the pre-show (or post-puke show because they were a whole punch of girls) but they of course did the &quot.Welcome back riders, how was the ride?&quot., where its always fun to give a rowdy response. The ride up the first long hill seems to take forever and while most of the time its spent chatting up your neighbor it builds a lot of suspense because all I can think is &quot.damn, this is a really big hill&quot.. The first hill is amazing. I love the front seat because that split second where you slow down at the top and then rush to the bottom is amazing to see. I recommend riding in the back because you feel a lot more of the thrill as well as being up in the air for longer amounts of time. After riding up front where its smooth the back is slightly rougher, but manageable. There are two trains a blue and green. One is noticeably older and from riding it so many times the older (I believe green) is much more rough and frightening. The second and third hill are just about the same and fun without the suspense. The second half coming back around is slightly rough going underneath the beams. It has an added jolt in the track that sends you right into the person beside you. Even though I know I&#39.m not tall enough to hit the beams it is still slightly frightening to me when underneath them. The bunny hills at the end are mostly to take up time on the way back but its fun and playful the way it jumps around. Right before the helix they take your picture, so make sure to make it a good one. My friends and I usually purposely make the most ridiculous faces we can think of. Last summer we were yelled at when the boys got a little dirty (lifting up their shirts, being ridiculous boys, ect.) but this year when we returned there were younger people working at the booth that found it hilarious and told us that it would be impressive if we could time a puke RIGHT as the camera went off... and then proceeded to show us an example picture of someone who did just that. The younger kids working there really liven up the place. Overall its a good, fun roller coaster. Not epic, and not too scary - just real good fun =] I give it a 9... not only because its fun but because its my favorite local ride. Shivering Timbers is highly and I mean HIGHLY overrated. I went on it this past summer, since my folks and I were in the Muskegon area and it was just normal. It was just an out-and-back version of Mean Streak at Cedar Point. I mean, sure it&#39;s not as rough as Mean Streak. I just generally thought the whole ride was overrated and overhyped.